Happy Holidays from the Kickabout Team! We are getting closer and closer to departure day. In just a few short weeks, Lorrie and the rest of the team will be heading over to the UK to pick up the cars and start the journey across Europe, through the Middle East, and on to Egypt to officially launch Kickabout: Africa 2010! 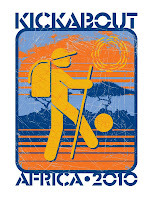 The Kickabout team would like to thank everyone for their support in helping Kickabout: Africa 2010 become a reality. We cannot wait to get on the road and help celebrate and support our great partners throughout Africa. Check back soon for new updates, new challenges, and new details about our coming adventure. (LOS ANGELES, CALIF.) – Kickabout Africa is honored to announce Grassroot Soccer as its third Signature Partner. Grassroot Soccer is a leader in the sport for development and HIV prevention fields, with flagship sites in South Africa, Zambia and Zimbabwe as well as partner programs in Tanzania, Botswana, Ethiopia, Kenya, Lesotho, Malawi, and Namibia. Kickabout will visit several project sites and organize friendly matches and tournaments to celebrate and highlight the great work being done by Grassroot Soccer. The Kickabout team will also work to raise money for those local projects through Kickabout’s partnership with the Plus 3 Network.